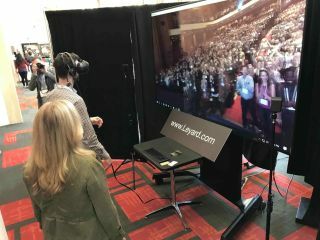 TEDx attendees were treated to a virtual reality experience of enjoying a standing ovation from the TEDx stage enabled, by Panogs, Dot-Dot-Dash, and Planar. The day began with a 4K capture of 360-degree video and audio of the full auditorium on their feet clapping. Throughout the day, visitors used HMD (head mounted device) VR headsets and headphones to experience what a standing ovation would feel like for a speaker on stage. An output of the HMD was fed in 4K to a Planar QE Series 98” display for the gathered visitors queuing up for the experience.Attendees commented that the experience was realistic. Their cheeks would flush and they would feel compelled to react to the crowd that was on their feet and cheering in the 360-degree video.